Sicily, Syracuse. c. 400-390 BC, unsigned dies by Euainetos. Decadrachm, 43.13gg. (8h). Obv: Quadriga galloping left, driven by a charioteer holding reins and directing the horses with a goad; above, Nike flying right to crown the charioteer; in exergue, panoply of arms on two steps: cuirass, two greaves, and a Phrygian helmet. Rx: ΣΥΡΑΚΟΣΙΩΝ Head of nymph Arethusa left, wearing a reed wreath, triple ear pendant, and necklace; around, four dolphins. Gallatin F VIIa/RIV. Of the Euainetos decadrachms, while many are signed, there is a large group unsigned with the cockle shell symbol behind the head of Arethusa. In many cases these are struck with some of the most beautiful dies. This coin has incredible centering. The obverse is complete except for the tip of one horse's nose. The reverse, bearing the portrait of Arethusa, is struck on a very broad flan showing the complete name of the city above Arethusa's head and all of the dolphins are extremely clear except for the fin of one and the tip of the nose of another. The centered head of Arethusa is beautifully struck, making it a monument of classical Greek art. 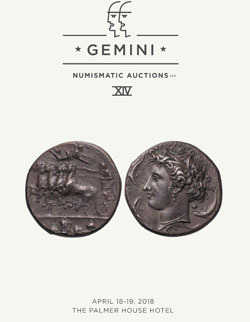 More important than the decadrachms of Kimon, this reverse die is one of the most copied coins in the world starting with immediately after it was struck, copied by the Carthaginians in Sicily and continuing all the way to Victorian times and beyond. Near Mint State. Ex Stack's, 12 January 2009, Golden Horn, lot 2135. 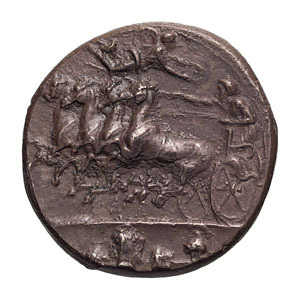 On the obverse, the charioteer seems to be rounding the turning post, the most dangerous moment of the race, so urges on the right-hand pair of horses with his goad while pulling back the left-hand pair with the reins. 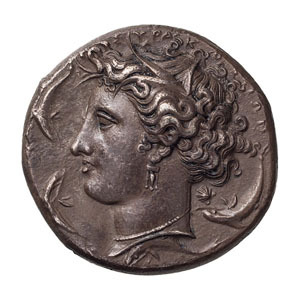 The drama on the obverse has its counterpart in the eternal beauty of the reverse, depicting the head of Arethusa, the nymph of the local well on Ortygia, a small island belonging to Syracuse, whose features were copied on many other Greek coinages and have also inspired modern connoisseurs such as Winckelmann, Payne Knight, and Goethe.